These declutter hacks are the three things you need to get your house clutter free in the new year. Research done at the Princeton University Neuroscience Institute found that clutter distracts us, drains us, and even makes us irritable. Let’s be honest, we have enough to be grumpy about, our stuff shouldn’t be one! Make sure to check out the 30 Day Declutter challenge, too! To really get a room completely decluttered and organized in a way that feels right, you have to empty it out first. Start from scratch. Seeing the room empty will make it feel fresh again and will inspire you to cut down on the things you put back in. Once you see that room in it’s bare bones you will be able to clearly see the potential. And yes, I understand this can’t work all the time, I certainly wouldn’t want to empty every kitchen cabinet. BUT, I would clear off all the counter space, shelves, windowsills, etc. Once the room is empty, set out three boxes labeled DONATE, TRASH, KEEP. Every single item you just took out of the room has to go in one of the boxes. The donate and trash boxes immediately get moved to the garage or storage for removal and the last one standing is what is kept. As you go through items in your home deciding whether they are keepers or not, ask yourself this question: If you were moving to a brand new home and had to decide to put that item in a box or just leave it behind, what would you do? If you have something that isn’t important enough to pack up, haul in a truck to a new house and unpack it, you don’t need it. Organizing and decluttering can be a completely overwhelming job. Often it’s decades of stuff that have piled up. But that doesn’t mean it can’t be done. You will feel so much better once everything is in it’s place and you have less stuff to deal with. 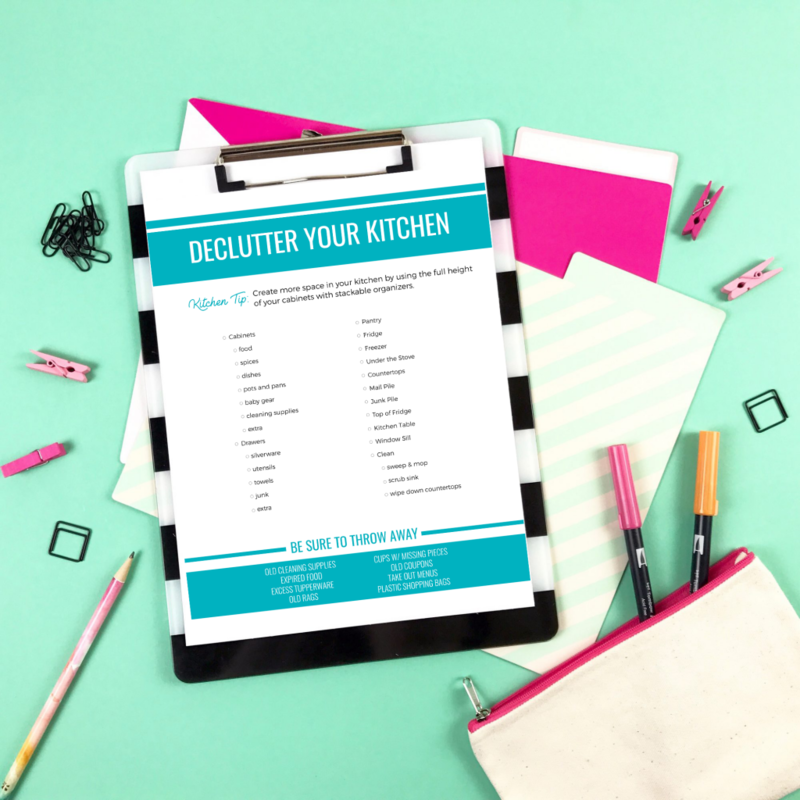 I made The Declutter Workbook for just $4 so everyone can get their hands on it and finally get your house clutter free!